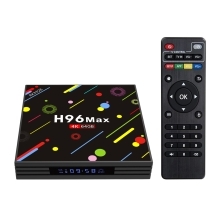 H96 Max-H2 Smart Android TV Box is your great choice and can meet your needs because it can change your traditional TV & LCD monitor into a multimedia center by connecting the Internet (Via WiFi or RJ45). With LED display, it is convenient to see the status of TV BOX. This smart Android TV Box will bring you much fun and convenience. Runs on the Android 7.1 OS which is perfect in productivity, stability and performance, along with various of features and optimizations, delivering an improved user experience. Powered by RK3328 Quad-Core CPU, it will be able to play 4K videos with H.265, H.264 and VP9 codecs. It also features HDR 10, HD 2.0a, USB3.0 and a Penta-core Mali-450 GPU. Based on H.265 HD decoding, it offers 4K * 2K output which provides you high definition viewing and fluent video playing, making it as the highest resolution for home movies. 4GB RAM and 64GB ROM, ultra-large capacity allows you to enjoy more pleasure. 2.4G /5G dual band WiFi, 10 / 100M LAN and Bluetooth 4.0 make home entertainment easier. DLNA, Miracast and Airplay: Cast the video, audio, pictures from phone or network to TV.